One fun thing about living in the Pacific Northwest – the land of Starbucks — is that we are often the “test market” for new and innovative things done by the unequivocal caffeine distribution dominator. Ten or so years ago, we had Starbucks Cafes, which actually sold prepared food, just like a traditional sit-down café. Those didn’t last, but I sure enjoyed them. Now, we are on the cutting edge of something totally different from Starbucks, though, I had no idea I was walking into a Starbucks chain when I stumbled on it. 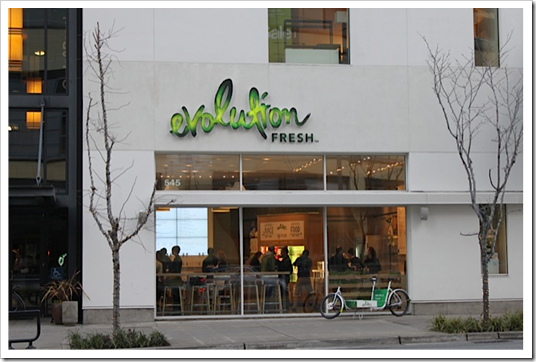 Called Evolution Fresh, this new venture is billed as a juice and smoothie bar, but, they have a food menu. And, it’s a “real food” menu. I am in health food heaven, honestly. Sadly, there are only two locations right now: One in downtown Bellevue, WA, and one in downtown Seattle. A couple weeks ago, I needed to get out of the office that I now go to almost daily (such a change from my work from home roots! ), so I took a stroll about six blocks towards Bellevue Square Mall looking for lunch. There is a grocery store across the street, so I thought I’d pop in for a salad and spin through the mall. But, I noticed a new restaurant in a flagship location where Starbucks usually has something brewing (ha, pun not really intended! ), which is the site of the old Starbucks Café, FWIW, and I went to check it out. I was lured in instantly, and decided to dine there. Thing is, at the time, I truly had no idea of its Starbucks affiliation. What finally clued me in was the “Ethos” water in the cooler. Sneaky SBUX, sneaky! I later Bing’d a bit to find out the roots of the store (you know I don’t Google…my bread is buttered by a large software company in this area, and honestly, Bing is fantastic). The Starbucks marketing machine is definitely hard at work to cover up its true identity and make the store unique – and it is mostly working! 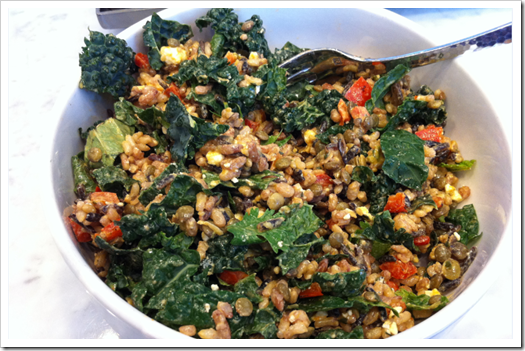 Lentils, Wild Rice & Organic Kale (Cal 330) With grilled zucchini, peppers, feta, julienned carrots, pepitas, sunflower seeds, flax seeds, fresh herbs. Quinoa, Organic Kale & Butternut Squash (Cal 280) With black beans, grape tomatoes, feta, scallions, pepitas, sunflower seeds, flax seeds, fresh herbs. I won’t lie to you. This chain is expensive, especially if you buy any juice or smoothie, which is really their main offering. I just had the lentil and rice bowl and a bottle of water and was out of there for about $10. That’s not really “fast food” pricing of course. But, I can see it really having legs and being popular in more health-conscious areas where people have expendable income to spare on healthy dining out. 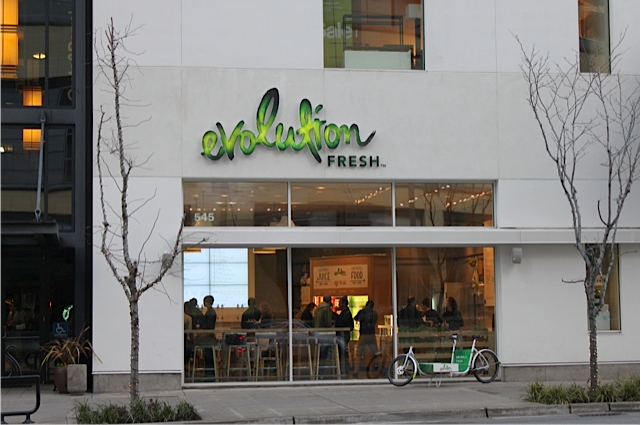 So, don’t expect it in places where fried chicken and greasy burgers rule, but I could see Evolution Fresh turning up in San Francisco, Portland, OR, Austin, and the like. Don’t quote me on that, though. I have absolutely no knowledge of their expansion plans – I am purely speculating here. When I get my kitchen back (someday, over the rainbow, when the skies are blue and I can boil things again), I hope to make a few copycat recipes for you. 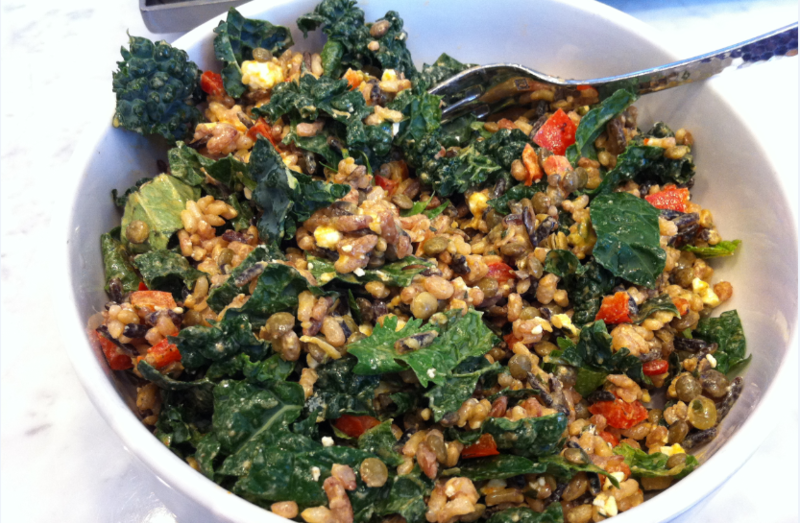 For now, if you want a healthy combo that you can throw together in a pinch, do this for one serving of the above bowl. I am seriously craving this right now! Mix everything except seeds and herbs together in a bowl and top with seeds and herbs. Can be heated or served cold. Let me know if you try it and if you like it as much as I do! hey, im curious about the calories/dressing. The website says 330 calories, does that mean when you order it the meal that you get will have 330 calories, or is that only without dressing? Did you personally add an extra lemon tahini to it yourself? Thanks haha, i eat their all the time and im curious weither or not im eating more calories than i thought. The 330 calories is without the dressing – which I guess is technically optional. The dressing was added by the EF workers – I just picked the lemon tahini, which rings in at 200 calories. Even with dressing, it’s still a good amount of food for about 530 calories!